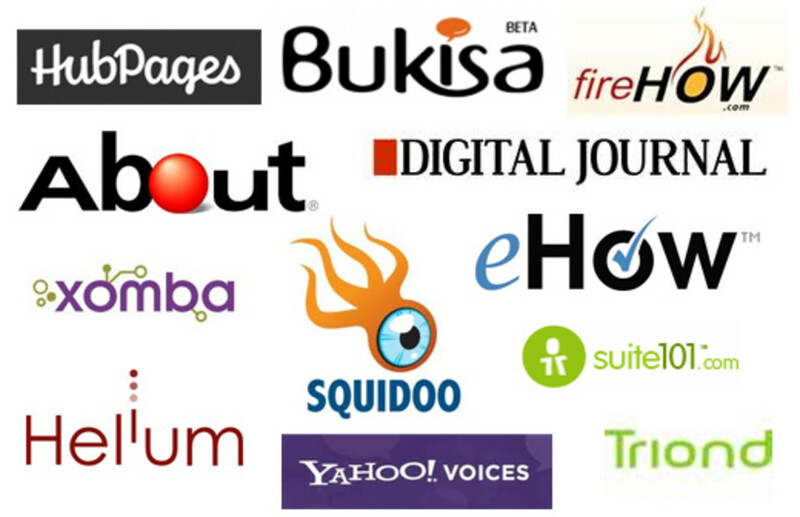 This hub offers solutions for Hubbers whose Google AdSense account through HubPages ran into problems and is either disapproved, under review, or getting a message that HTML ad code must be added to their account before it can get the final approval. Here is a summary of the Google AdSense approval process from Google AdSense Help. 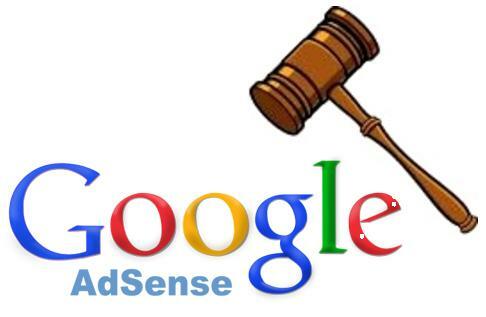 Applications received for 'AdSense for Content' after August 31, 2011 have to go through a two step review process (If you are monetizing with a different product such as AdSense for search, mobile, video, games, etc. you will not be subject to this two-step approval process.) and will receive email notifications at two key points. Live ads won’t immediately appear once the ad code has been placed on the submitted site. Since the application hasn’t been fully approved yet, temporary “blank ads” will be shown instead. These blank ads will blend in with the background of the page, so users won’t see them and the user experience won’t be impacted. As a result, there’s nothing to click on and thus revenue can’t yet be generated. If the applicant logs into their AdSense account at this stage of the review process, they’ll see a red banner with a reminder that their account is still 'under review'. According to Google AdSense help, if your application has not been approved you should refer to the application status email message they sent you, it will contain details on why your application was disapproved. 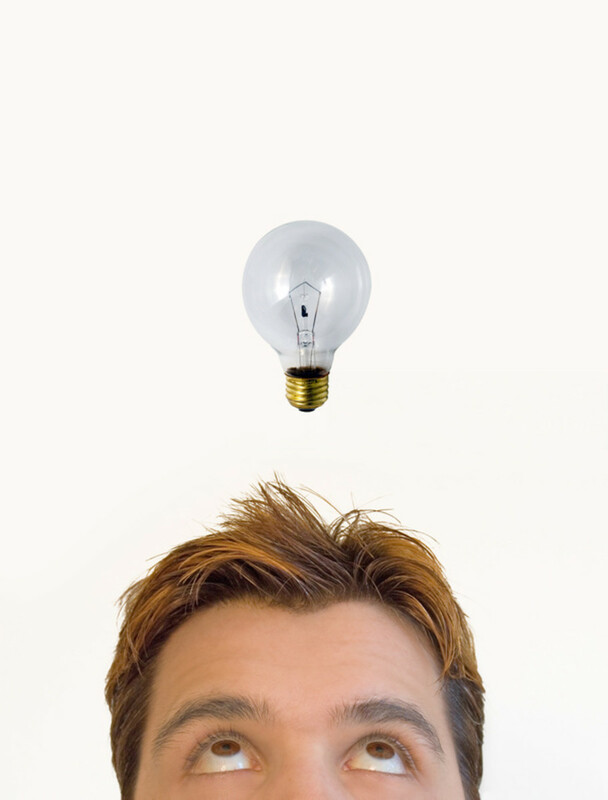 Below are some of the most common disapproval reasons and what you should do to correct them. 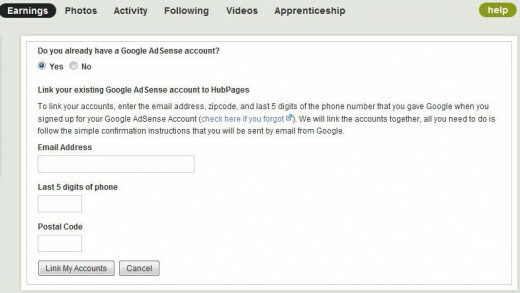 Go to www.google.com/adsense and sign in with the email address you first applied for an AdSense account with. On the next page, you will see a form where you can correct your address data and resubmit the application. At this moment, AdSense policies only allow one account per publisher. Please refer to the email they sent you and follow the steps outlined there to either keep using your existing account or move to a new account. Make sure to follow the instructions in the email rather than just closing your old account, as doing so will require you to submit a new application with a different email address. Did you have any issues setting up Google AdSense? Yes, but it's all set now. Yes and I still do. No, but it was confusing and difficult to do. Nope, breezed right through it all. Google AdSense? What's Google AdSense? Problems Signing up for Google AdSense via HubPages. Below are a few of the problems I encountered and how you can go about correcting them. When you sign up for Google AdSense through HubPages they tell you to make sure you have sufficient content. What is considered sufficient content? 5 hubs? 10 hubs? 50 hubs? How are you supposed to know? Well, I had three hubs, all on the topic of genealogy and I thought it was obvious what my niche was. So I went through the process of applying for an AdSense account and within 24 hours I received an email that I was "disapproved" for lack of content. The email also stated I could reapply when I had more content. So after I had published a dozen or so hubs (on various topics) I went back into 'my account' on HubPages and reapplied via the 'Configure Google AdSense' button I used to apply initially. Within 24 hours I received an email stating I had made it through the first step and my account was now "under review." The email also said that when the account received final approval I would start seeing live ads on the site. If I had to do it again I would wait until I had published 12 hubs before applying for AdSense. If I had I wouldn't have spent the first month dealing with the consequences of being "disapproved." Problem #2: Google's sends you an email stating you must add HTML ad code to your site before they can finalize your account. 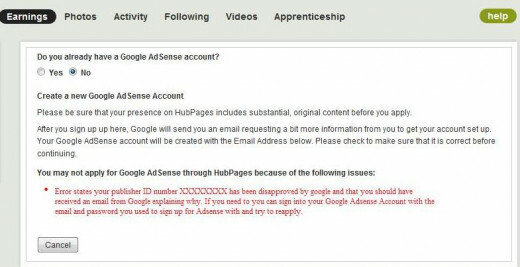 This is very confusing for those applying for an AdSense account through HubPages. The email sent by Google is a generic email that assumes you are applying for an AdSense account for a website or blog. Hubbers DO NOT have access to the HTML code on their HubPages account. The HTML ad code is updated automatically for you by HubPages because they are a Google AdSense Host Partner! Did you get the joke above? Problem #3: HubPages is showing "Google AdSense Disapproved" and Google AdSense is showing "Under Review" but live ads are showing on your hubs. Google AdSense Help clearly states "you will begin to see live ads once your account receives final approval." Live ads started to appear on my hubs a few days after I received the email that my account was "under review." 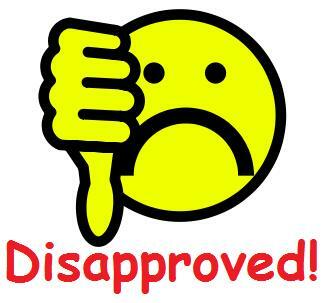 According to AdSense that meant I had "final approval" but HubPages was still showing my account as "disapproved." 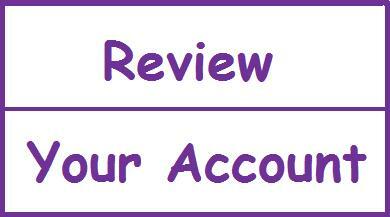 When I signed on to my AdSense account it had a red banner across the top stating the account was "under review." I figured it was a timing thing between HubPages and Google so decided to wait a week. After a week HubPages still hadn't changed. I scoured HubPages and Google AdSense looking for an answer. AdSense was no help because it's 'help section' assumes that you are trying to monetize a website or blog not apply through HubPages. I posted a query in the HubPages forum where another helpful Hubber confirmed that my hubs were indeed filled with ads but until HubPages and Google "agreed" with each other I wasn't being paid for any of them. I emailed HubPages and pasted the exact line from Google email stating that "when live ads are being shown the account has been finalized" and inquired as to why they still showed "disapproved?" I was told that I could go into my account settings to turn off the ads. I was also instructed to contact Google to see why HubPages was still showing "disapproved." Not helpful. Another Hubber suggested cancelling the account and creating a new one with a new email address. HubPages wouldn't allow me to because it already showed the disapproved account. When I tried to apply via Google it said I must apply via HubPages. Anyone else getting dizzy from this run around? In the end I fixed the problem on my own. I never did find an answer on HubPages or Google AdSense. I don't know how or why what I did worked but I did capture the screen shots so that I could detail it in a hub for any other Hubbers who run into this problem. 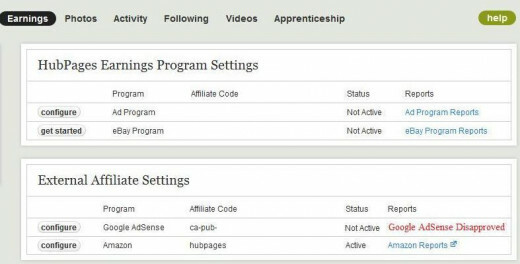 After eight weeks on HubPages I still couldn't sign up for the HubPages Ad Program because Google AdSense was still showing "Inactive" and "Google AdSense Disapproved" on my account. My account was originally disapproved for lack of content. I reapplied through the screen above and Google sent me and email stating the account was now under review. However, the error message on HubPages never changed. It stayed that way for four weeks as I tried every suggestion given to me and researched everywhere to find out what the next step was. Note the Question: Do you already have a Google AdSense account? After clicking "NO" and trying to create a new AdSense account last week with no luck I decided to try clicking "YES" to see where it would take me. The above message popped up stating I already had an approved Google AdSense account and that I should not apply again as each person is only allowed to have a single Google AdSense account. It also said if I would like to change the account associated with HubPages instead to select "YES" above. Over four weeks of BS back and forth with HubPages and Google and nowhere did it say this needed to be done. It was purely by accident and out of sheer frustration that I was willing to try anything. Even my email to HubPages stating live ads were being displayed on my account but they were still showing it as disapproved didn't tip anyone off to actually look at it my account. So after manually 'linking' my Google AdSense and HubPages account you can see above that the status changed to "Active" and the "Google AdSense Disapproved" has been changed to "Google AdSense Reports." Now that I finally fixed the Google AdSense issue I was able to sign up for the HubPages Ad Program. I clicked on [Configure] and the box below opened. The message says that I have completed all the necessary steps to activate the Ad Program. I clicked the [Activate the Ad Program] button and the box below opened. As you can see the Google AdSense and HubPages Ad Program are now active on my account. Fixing the issue was purely accidental on my part so I am not the expert but if you are having trouble and have a question feel free to ask me. If I can help I gladly will. very nice article really helpful , keep doing great work. Hopefully this Hub will be found by new users. There is never a lack of questions on this topic over on the forums! I think a lot of people need to hold of until they have at least 30 - 50 hubs before they apply. It is easier to wait, than to fix an account. Thanks for the information. This helped me out a lot getting everything set up. Very useful guide even if you just stumbled across it. what if it said that It appears that your Google AdSense Account, with the publisher id xxxxxxx is no longer associated with HubPages. 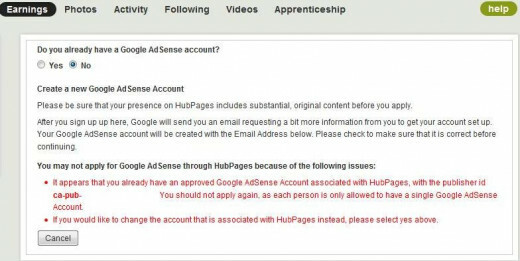 Your application may have been rejected by Google, you may have refused the association with www.hubpages.com through the AdSense Account Access Page, or your previously approved account may have been disabled due to violations of the Google AdSense Terms and Conditions. You should not apply again. what shoud I do? You're welcome. I know it was very discouraging trying to get through it, so glad you have it straightened out now. Thanks for taking the time to read and comment. This helped a lot. I was having many of these problems when I first set up my Google Adsense account, but now everything is working fine. Thanks! Thank you dwachira! It WAS very confusing. Google and/or HubPages should have a better explanation in their help menus. Until then, I hope this hub keeps helping. Thank you for taking the time to comment! I was a victim of being confused on how to implement the HTML code on my site. I had to Hub hop a lot trying to find answers as to how one place the code on Hubpages. Your article explain this very well and i hope newbies to Google AdSense account will find it very useful. Voted up, useful and shared. Awesome!! I know how you feel. 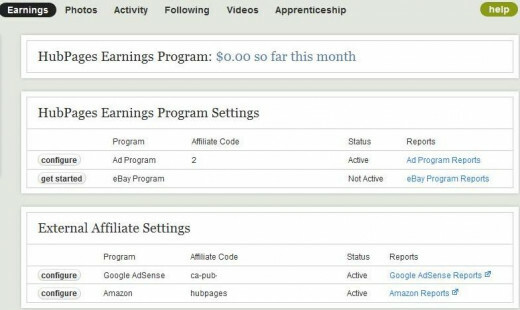 When my account registered the first earnings...10 cents, I took a screen shot of it and saved it! 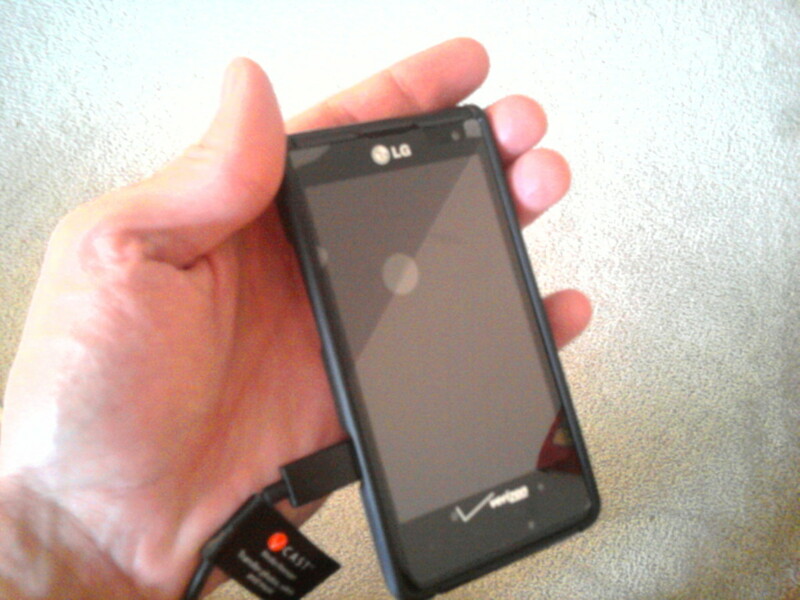 Mostly because I was thrilled it was actually working. :) I appreciate your taking the time to update me. Hopefully you are the first of many who will find it useful. Christine, just wanted to update you on my adsense account. Today I received the official "Congratulations" email from adsense. Now I can start bringing in the big bucks! LOL, I think I'm already up to 5 cents. Well, its the thought that counts, right? Thanks for all your advice in the hub. This was very helpful. You're Welcome MPropp. I will keep my fingers crossed for you! Thanks for taking the time to comment. Very interesting. I had the same issues...and I also found a hub that advised me to switch my settings to "Yes" under my earnings. I was immediately accepted! But, alas, it only lasted for like 2 days. Then I received email from google adsense saying that they had finally completed the second stage of review (I had waited 3 weeks), and I was disapproved for "not adhering to google policy". I couldn't find anything that wasn't following policy, so I clicked on reapply and received another email saying "Welcome....we'll do a conduct a second review...." Now I have waited for another 3 weeks and I'm still disapproved. I decided to go back under my earnings and click "yes" to my account again, like you suggested. Guess what? I was approved instantly! Now, if only it will last more than a day or two....I have to say, the whole process is extremely confusing! Thanks for sharing your experience. It was quite confusing but hopefully this hub will help the next person that has these issues. That link is very informative but also unclear. I read it several times before applying. They tell you that you should have a FEW (in the US that is three) quality hubs and then they go on to tell you quality is more important than quantity so if you are a newbie their directions are ambiguous at best. They should suggest you apply after you have published ten quality hubs or not even let you apply till you have published ten. It would probably save them headaches as well. :) Thank you for taking the time to comment. I'm glad you finally got through all the confusion and have your Adsense account set up. I'm sorry you didn't get clearer advice in the forums - any experienced Hubber could have explained that whether you have an account or not, ads appear on your Hubs right from the very beginning. As you pointed out, Google's instructions (including that bit about "live ads") applies to people with their own blogs/websites, not to revenue-sharing sites.